This unsettling creature is called The Nonsuch. 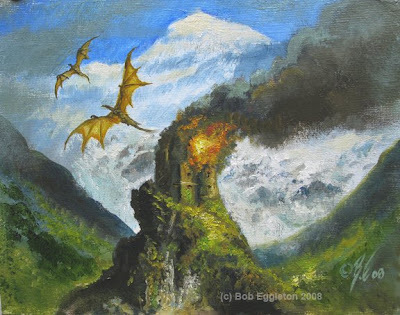 It's part of a three-story Brian Lumley collection, due out from Subterranean Press. 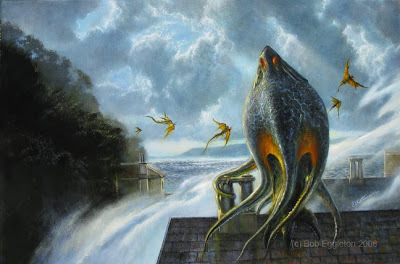 Brian wrote this new story and what it involves is an almost Night Gallery-like story of a man staying in a hotel and he's being slowly stalked by a strange sea-borne cephalopod. I used reference taken at the very hotel we used to stay at for Keoghcon down in Torquay, England as that is where the action takes place. The image took forever to form in my head. This was a case wherein the cover was a tough thing to do-as Norman Rockwell used to say "Some come easy, some come hard". It's also a truly frightening story, one of Brian's scariest I have to say. 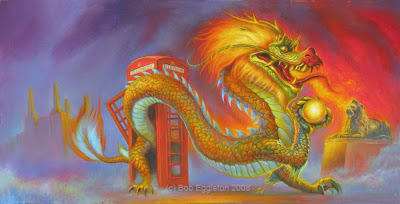 The painting turned out 20x30 inches, and done in oils. Happy Turkey Day....the day of consuming our favorite avian meal!! The best part was afterward when they showed...movies. No football in our house. Those were the days... of KING KONG, KING KONG VS GODZILLA and MIGHTY JOE YOUNG in the afternoons on local TV after the Big Meal... and then, on Friday it would be Godzilla Day....ah, that's what DVDs are for. But there was something special about having to catch the film on TV...lest it may be awhile until it airs again! 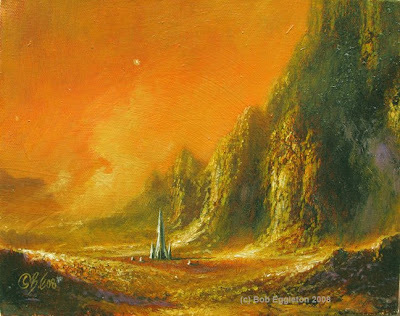 Kind of a slow week and just finished up a new Brian Lumley cover for Subterranean Press which I'll post soon. I am through a majorly busy time and while I've got things to do, I can slow down a bit in the next few weeks. What a year it's been. It's a nice slow day...and alot warmer! "A" is for Actors, Artists, Astronauts and Anime!!!! 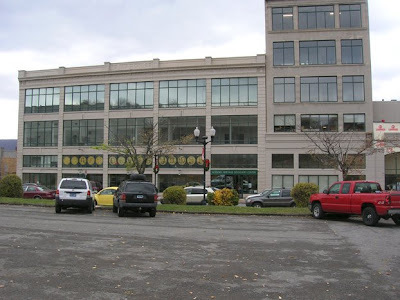 Just got back from a terrific weekend at The New England Fan Experience(Formerly known as United Fan Con) in Cambridge Mass. What a great time!!! 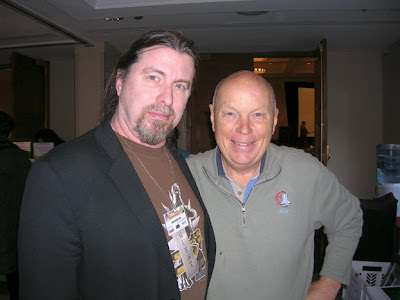 I think what was my personal highlight was re-connecting with old friend Story Musgrave, astronaut of many Shuttle missions. Story is, in short, a genius. And he's a gentle soul of a person, a space man with the heart of a poet. I feel lucky to know such a guy. Also, hooked up and became friends with Andrew Probert, designer extrodinaire of the Enterprise D in STAR TREK: THE NEXT GENERATION and, going all the way back to working on STAR TREK THE MOTION PICTURE 30 years ago!! He's been a total idol of mine for many years and, here I was talking shop with him. Also saw Mark Goddard, actor from LOST IN SPACE-he's a local to the Massachusetts area. Also on hand was Morena Baccarin from SERENITY and, Peter Davison-the 5th DOCTOR WHO. 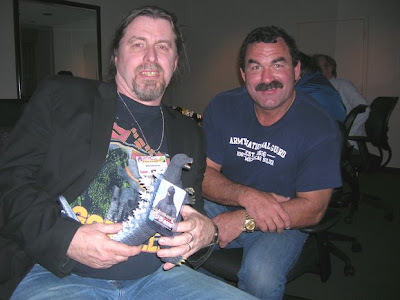 My Godzilla time was spending good time on stage with actor/kickboxer/fighter Don Frye who played Captain Gordon in the 2004 film GODZILLA FINAL WARS. He's a great guy to just kick back and chat with. He and I both worked on the 2006 film THE ANT BULLY(he did a vocal part) andit could be said we were both in a Toho Godzilla film-me as an extra in 2002 and him as a lead in 2004's entry. He will be in a major new Michael Mann film called PUBLIC ENEMIES with Johnny Depp and, Christian Bale both who he called "Class act guys". We had a great time at a banquet and, in the morning a terrific breakfast(we ate and chatted with Morena Baccarin)All in all a great time, and the planners of this year's NEFE deserve much kudos for putting on a great show! 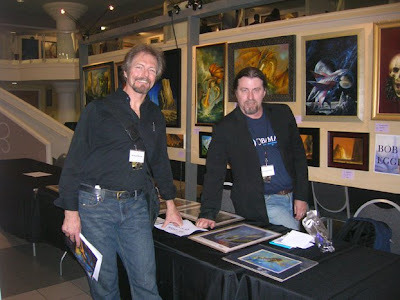 It was a mixed media show, with an "A" list of guests-actors and anime and astronauts and artists. This show was a great capper on a year of running around and what a way to finish it up!! It went from temps, last weekend approaching the 70's to a bone-chilling high of 31-with wind chills that apparently brought it down to the teens, within two days. Seems a mid-winter type cold wave has moved in and is hanging around the New England area at least until next week. I hate this kind of cold. 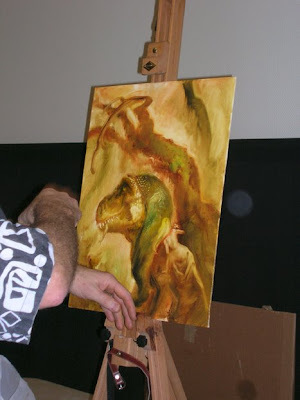 Going off to Boston this weekend for NEFE-The New England Fan Experience which I am to talk about Godzilla, SF, and sit and paint at a table. This is the last "con" appearance for the year and I for one, am jumping for joy at this prospect. I'm exhausted and kind of fed up of travelling and running around for this year. Still have plenty of things to do, which I think is a good thing these days. Couple of nice little Marscapes. People seemed to really like them so here I am doing some more. 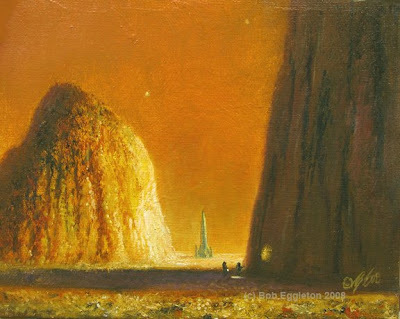 I love landscapes, and I tend to take a romantic's view, rather than the "reality" as it were. I've dumped memberships in various art organizations over the years. 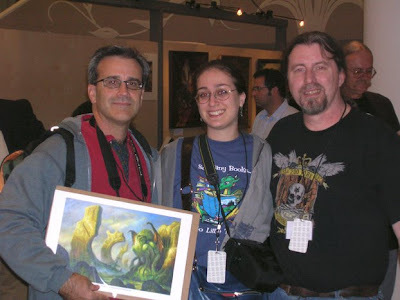 I used to be a Graphic Artist's Guild member and I dropped that(saving myself a whole buncha money), and then the International Association of Astronomical Artists and then The Association of SF/Fantasy Artists-another group I dropped that became so disorganized and marginal that it wasn't funny. I found these national/worldwide "art organizations" to be entirely non-entities. They might have looked good on a resume ages ago, but that's a matter of opinion, now. Certainly they did nothing for me in terms of career betterment. You can save yourself alot of money in dues by steering clear of such things because so much info is free on the net anyway. I know people who pay hundreds and even thousands of dollars per year to belong to such groups. I have belonged to a few in my life and only come away with indifferent feelings. If it works for you, so be it, but on the whole, save your money and your time. HOWEVER(I added this at the urging of a friend and she's right!) 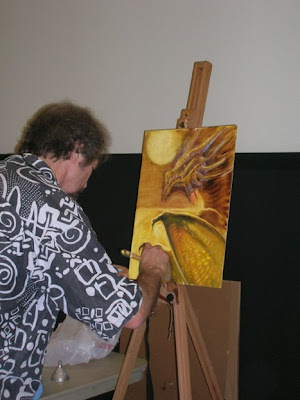 I have found "community" arts organizations can be pretty fun, social and beneficial. I belong to one that costs nothing called "CreateRhode Island" and there are various art clubs that not only do good shows, but also need the help and organizational thinking. These kind of groups can only help the community and, are more "hands on" as opposed to fraternal, which the ones I described above tend to be. 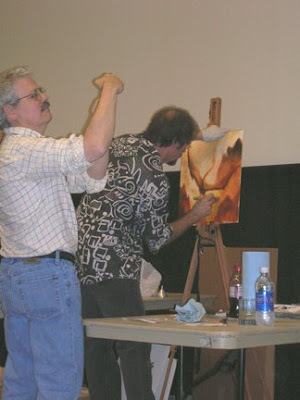 There are also various oil paint, watercolor societies and such that are well worth time and effort. I think the key is not to be too focused on speciality and look at an overall view of them. They're terrific for group shows, networking and socializing(read that: getting out of the studio and enjoying company). In Ten Years...Steady as she goes.. The passage of time, in ten years has hit me like a brick. Ten years ago, I'd just gotten married and, my Dad was dying(the 10th year to the day will be the 17th of this month) in a terrible, situation I had no control over or could change. It was fairly wrenching. I still don't know where all that strength came from. It will be interesting what this new era may have in store for us, in 2009. I'm an independent- I have high hopes with President Barack Obama. Did we ever think in our lifetimes we'd see another giant leap for Mankind in such a way as we saw on the night of November 4th??? When you think of events of 40 years ago and more?? Certainly it will take a long time, to fix some of the things that have recently culminated for the worst, in various ways-financial crisises and wars-but I think, they can be overcome and we'll be the better for it. Dictators and terrorists and overpaid Wall Street CEOs, come and go, they rise and fall to obscurity. But, dreams go on. I try to be positive. That's why when you read some blogs, a great deal, people seem to vent and rant about the negatives. I tend to not give much credence to Biblical predictions and Mayan clocks and all that which, to some indicate doom and gloom. The truth is, we're really lucky. 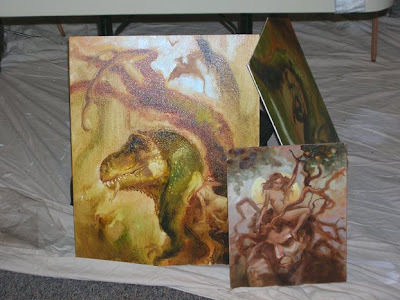 Some finished paintings from the demo. 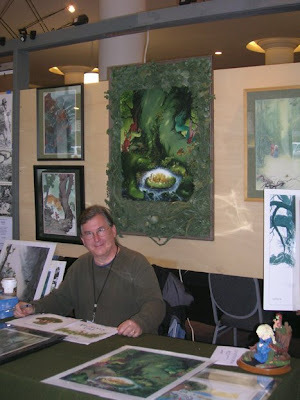 At right is a Tom Kidd/Michael Whelan work. 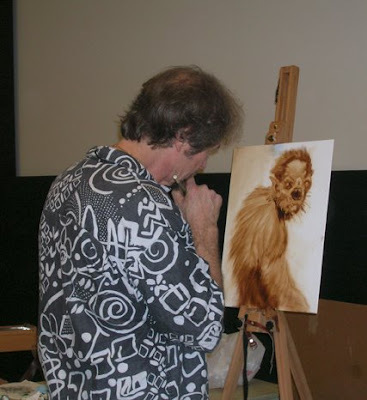 Michael Whelan takes over and "Whelanizes" the piece! 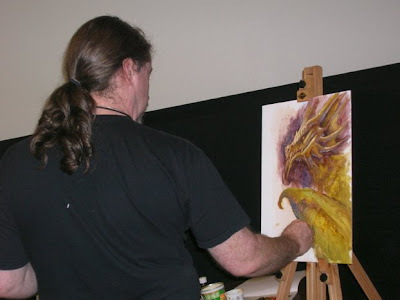 Here's me starting a "Turner Dragon"
All in all, lots of fun and always these demos give us the freedom to stretch ourselves and interact and watch how one style works off another and so on. It's a learning experience and really quite amazing and, it's done in all good humor and intent. There's no egos or nastiness involved, that would defy the whole point!! 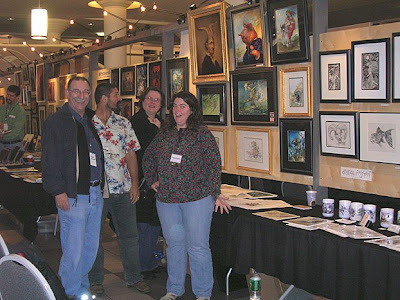 And Still MORE Illuxcon! PAINTING!! 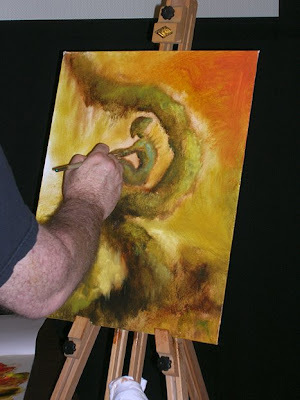 That's Whelan's hand working on one of mine! 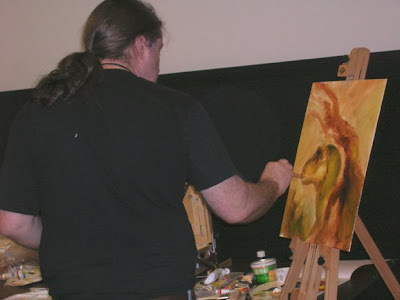 Here's me beginning the one above that Michael finished! Tom examines tubes of paint while Michael works on something I started! As always alot of fun. More pix to finish this off tommorrow. What's great is the end result of working this way with other talented people in a fun and relaxing setting. Tommorow pix of the painting jam!! Check back! 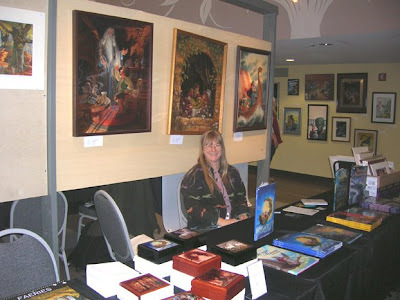 Here's a sample of photos from Illuxcon this past weekend. A good time was had by all. More to come as well! 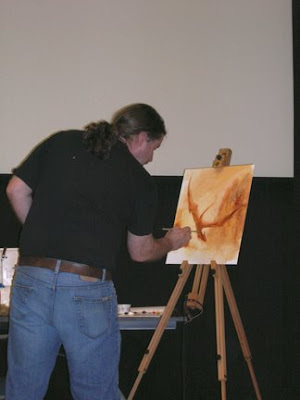 Photos from the painting demo with Michael Whelan, Matt Stewart, Tom Kidd and myself in the next few days so stay tuned!!!! 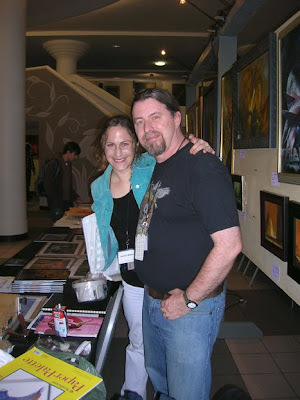 The "24 Hugos" Shot-Michael Whelan(15) and Me(9)! Not too shabby. Tom Kidd looks askance at his wife, Andrea(left) and her X-Ray eyes! This one is left from Illuxcon so here it is. A frame can be added for extra $$ so please inquire! 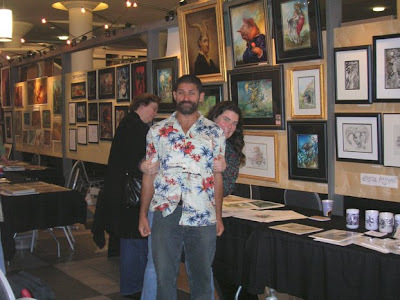 We went to, and got back from Illuxcon in Altoona PA. 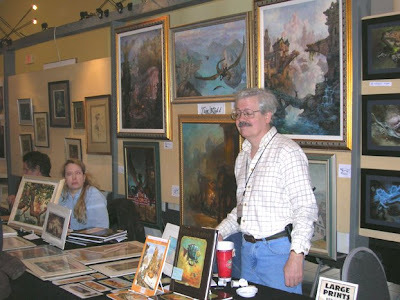 Hats are off to Mr Pat Wilshire and his lovely wife Jeanne and their various helpers for basically wowing all of us with the superb effort in pulling off what may be the first "SF/Fantasy Art Expo" in the world of it's kind. 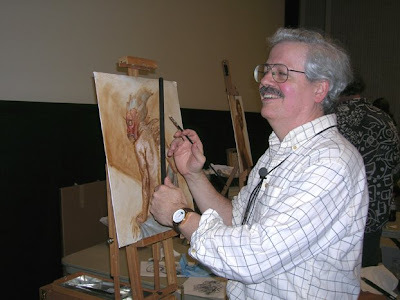 All the names were there-Michael Whelan, John Jude Palencar, Boris Vallejo, Julie Bell, Scott Grimando, Omar Rayyan and his wife Sheila, Charles Vess...I could go on and on. It was as social as it was profitable! And worth the nearly 9-hour drive each way. I'm too tired at the moment to go into details too much and we have some pics of the event as well. It was the topper on a fantastic week, after the historic election and all. As Bob Dylan once sang, "The times they are a-changing". Enjoy. One of my favorite songs. Someone told me I should listen to it, to help with the grief of the passing of a good friend in 2002. It reminds me of all that's good. And I think today is a good day to enjoy it. And you thought I didn't do these paintings anymore. I do, I'm just exhausted. But these I am bringing to Illuxcon. I may have 'em left after, so do write if interested as they'll be framed. I have a recent fixation with Mars as can be seen, so stay tuned!! 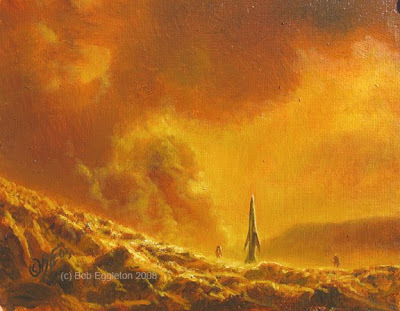 Of Late I Think of Mars (6x36 inches oils) So I got a long canvas pretty cheap because the store had a time selling long sized canvases but these always present a challenge to me to create something fun in them. SO I did a long rocket on a long Mars panarama, partly inspired by the recent photos from Spirit and Opportunity and partly what I "saw" in the blank canvas. The result was alot of fun and came out of my hands pretty fast. 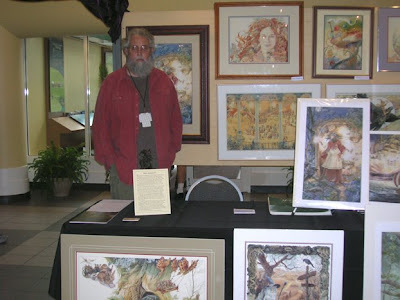 I'm bringing it to Illuxcon this weekend in Altoona PA. 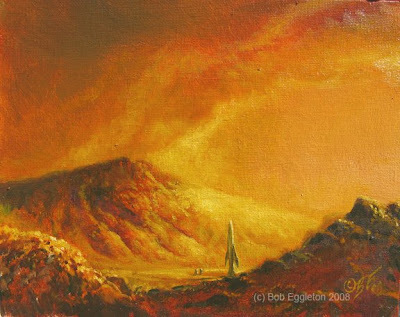 If you are going you can see it for real, if not and I still have the painting when I get back, pleasde inquire as to the price. Click on the image if you want a nice close, look. And I do mean close! Ever felt like it's one of those weeks?